'S e dùthaich anns a' mheadhan na h-Àisia a tha ann an Cìorgastanneo Kyrgyzstan. Tha crìochan aice sa tuath le Casachstàn, san iar le Usbagastàn, san iar-dheas le Taidigeastàn agus san ear-dheas le Sluagh-phoblachd na Sìne. 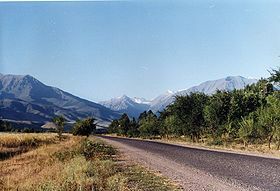 Tha Bishkek na phrìomh-bhaile. Air a tharraing à "https://gd.wikipedia.org/w/index.php?title=Cìorgastan&oldid=498052"
Chaidh an duilleag seo a mhùthadh 24 dhen Ghiblean 2015 aig 15:16 turas mu dheireadh.